This year is all about organization. We see and hear it everywhere. 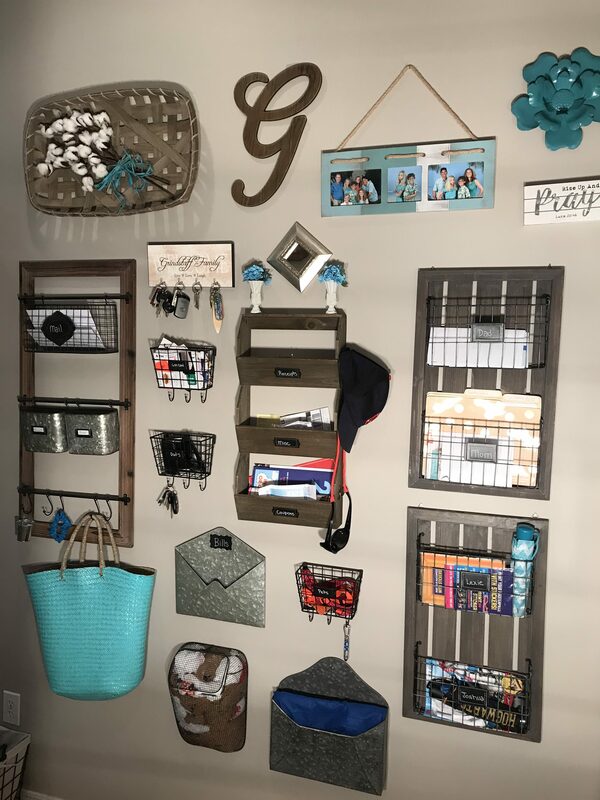 From the new organizational items on the market to the new TV shows about organization; organization is definately on everyone’s mind this year. 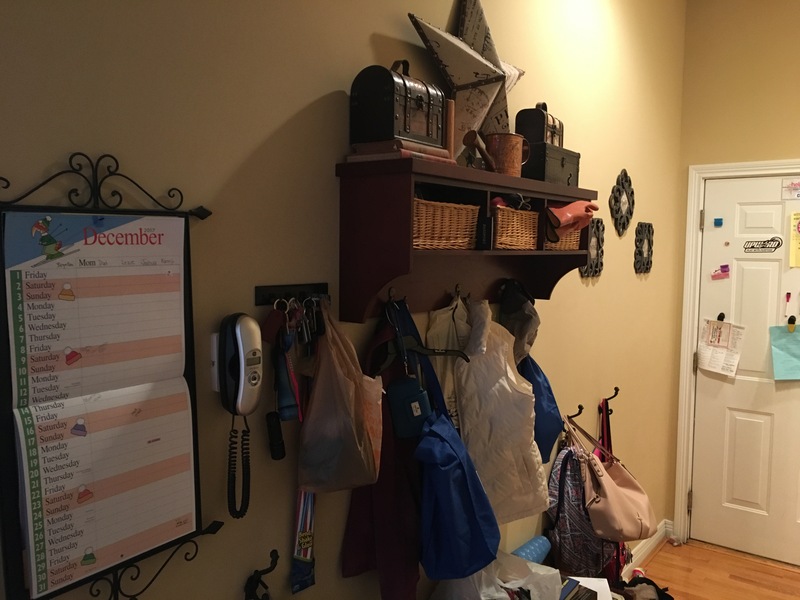 I was able to utilize our rather long family entrance hallway (you know, the one to the garage since we never actually use our front door) to organize several, often chaotic, tasks into one area. Areas such as this have many names. Some people call them “command centers”, some call them “family planning centers”, and some call them “drop zones’. I have also seen them referred to by many other names but whatever you call them, having several task areas together has simplified my job and helps keep things more organized. As I have said in previous posts people use command centers for many reasons. Your reasons may be different from mine. However, I hope you can use the parts of my design which suit your needs and learn from my mistakes to make your path to the perfect command center more smooth. I was predominately looking for organization, not only for our things, but also for our lives. I believe I referred to it as Organizing the Chaos. Now that my command center/drop zone/clutter eliminator is complete I can look back and say I am very happy with how it turned out. Of course there were mistakes along the way but I learned a lot in the process and now I couldn’t be happier with my results. I divided my hallway into two distinct areas. One side is for planning and the other is more a drop zone. Let’s first take a look at the planning side. What’s for dinner? What time is my game? Where is my homework? Are we out of bread? Do you hear these questions as often as I do? Thanks to the planning side of my family command center those are some of the questions that, not only am I now able to answer, but my family can also answer for themselves if they so desire. They do not typically desire, by the way. They still prefer to ask me. Which is OK because I now know the answers! The dinner menu not only has our menu for the week but it also has a spot at the bottom for requests for next week. This has been a HUGE hit with my daughter who frequently adds dumplings to the requests. I believe posting our family dinner menu has been great for several reasons. It really helps with grocery shopping, as I have to plan dinners out in advance now. It also helps my husband, who typically eats lunch out with coworkers know what’s for dinner that night so that he doesn’t eat the exact thing for lunch that I was planning for dinner. The “requests” section also helps me to see what things my family wants to eat more often, which helps me with planning. 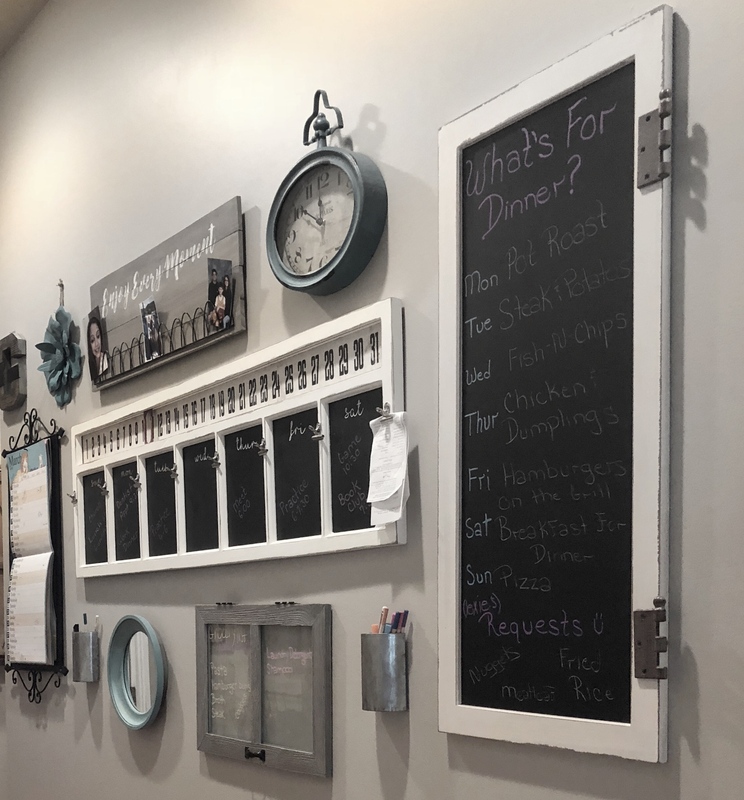 More on how I created the family menu board can be found here. The daily calendar with the attached bulldog clips keeps track of who needs to be where and when. And the clips can be used for homework, bills, etc that need to be available on a specific date. I had each family member choose a color of chalk pencil/chalk marker and I use these on the weekly family planner. Being able to see at a glance who has to be where when is a great help. To see more about our weekly family calendar, please click here. On the far left of the picture is a Mom’s calendar. It can be found here. It’s where I keep track of things in the coming weeks and months and for the entire school year. I love how this one organized the family members and the days of the week. I also love that it fits in my calendar frame which was a Christmas gift from my Mom several years ago. And as small as they are, I think the pencil cups are what keeps my family using the planning area. With pencils, pens, erasers, etc right where they are needed, there is no excuse for not using the planning area. Well, actually there are tons of excuses, but at least, “I couldn’t find a pen”, isn’t one of them!! I keep one pencil cup near the monthly calendar and one between the menu board and the grocery list. The one near the monthly calendar has regular pens as well as chalk markers and pencils and the one near the menu board and grocery list has chalk markers and pencils as well as a paper napkin which can be used as an eraser. The exact pencil cups I use are no longer available, but these are very similar. 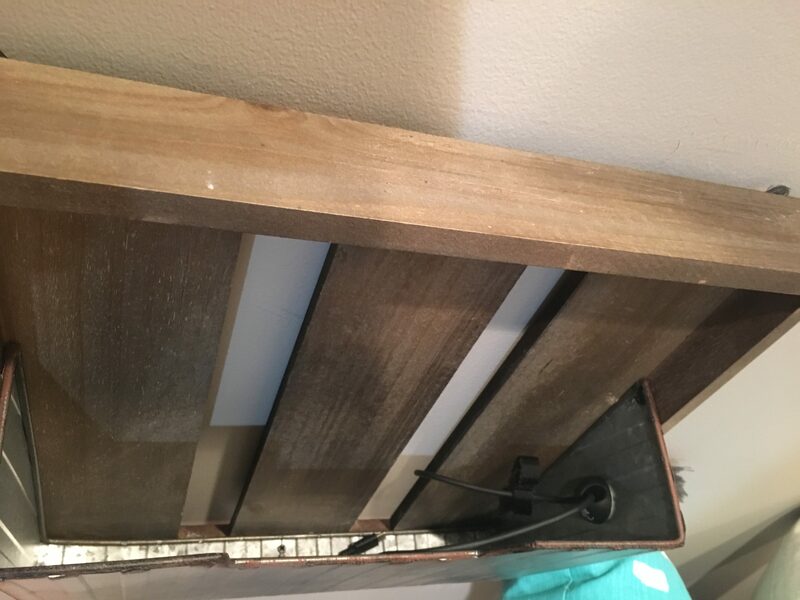 Hobby Lobby – The chalkboard used for the Menu Board, the weekly planner, the turquoise clock, the letter G, the round mirror, and the Enjoy Every Moment photo holder – To see how I added a whitewash to this very orange-y photo holder, please click here. Michaels – the Turquoise flower. Amazon- the pencil cups. The specific ones I purchased are apparently no longer available but either of these would work as well I believe. For many reasons, this is the yearly calendar I prefer. Chalk markers and pencils can be found at the links below. On the opposite wall lives the drop zone side of the command center. Here we have mail bins, shoe cubbies, and spots for all the miscellaneous items I typically find on my kitchen counters. The three hooks in this photo are used for Mom & Dad’s jackets and Mom’s purse (there are 3 more hooks around the corner for the kids jackets and backpacks). The three small fabric bins are used for miscellaneous items. There’s one for Mom, one for Dad, and one for everyone. Mine contains my Bible and a wristlet I sometimes carry instead of a purse. My husband’s has his work gloves, some sunglasses, and a tape measure. The family bin has miscellaneous items including our season passes to the local amusement park. I used Rust-Oleum 302596 Chalked Spray Paint, 12 oz, Chiffon Cream/Off White to paint the bench, shelf, an old mirror frame and the two small trunks which sit on top of the shelf. This paint is very easy to use and a great spray paint for beginners. As always, with spray paint, it’s best to paint several light layers. This helps prevent runs and gives you a better overall look. 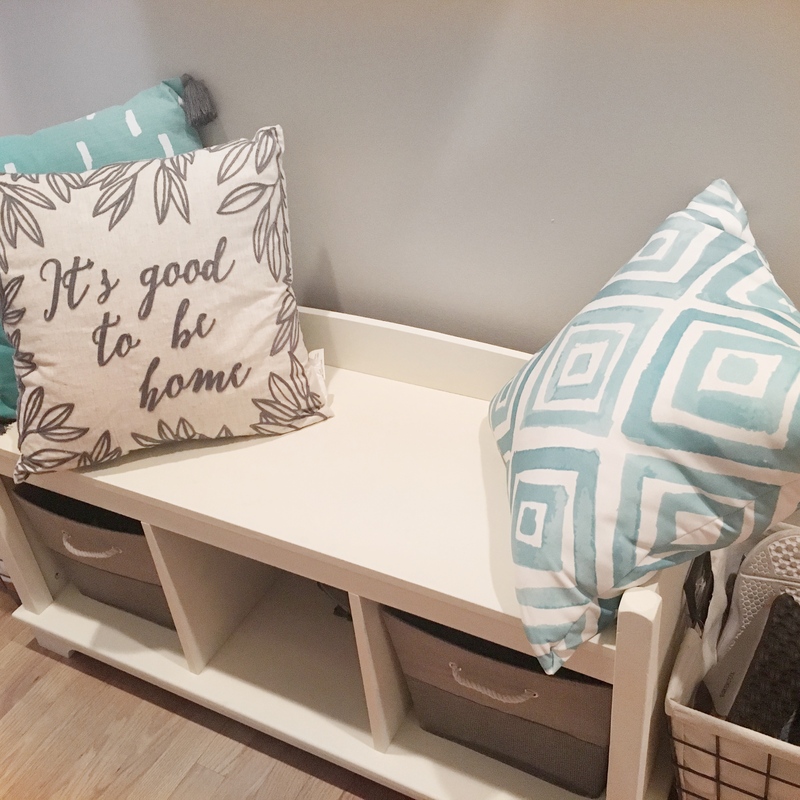 This bench contains two storage bins, one for my shoes and one for my husband’s. In between is an open compartment where we store sports equipment. During baseball season it contains gloves, the scorebook, etc. During basketball season it will hold my coach’s clipboard where I draw out plays for the team, a whistle, etc. At each side of the bench is one of these cute baskets from Hobby Lobby. The kids use these for their shoes. I would love to have a built-in cubbie system with at least 5 compartments, but there isn’t the space or budget for that at the moment, so this is what works for us for right now. Organization side of the Command Center. 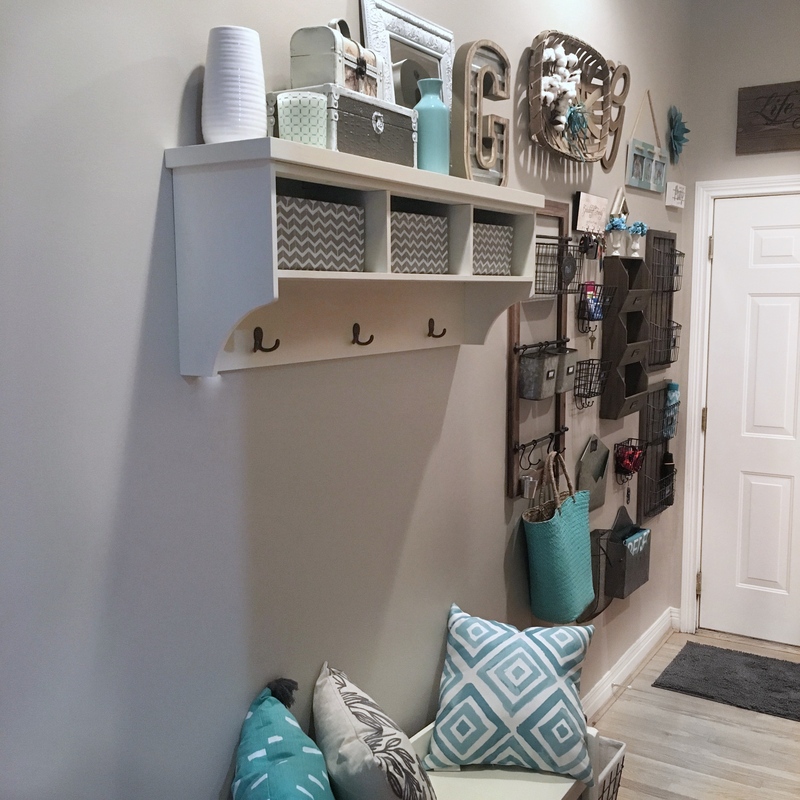 There are many other items you can add to your command center to help you maintain organization in your home. Beginning on the right of the photo above, I have an organizer from HomeGoods. The basket on the top is where we drop incoming mail. One of the solid metal bins in the middle contains random little items of mine and is labeled Mom’s. The contents of the other is ever-changing and I labeled it “Project”. It contains whatever little project anyone is working on that I find on the kitchen counters. Oops. Our home has a finished basement and the stairs are right around the corner. The turquoise basket contains small items that have been left upstairs but should be returned to the basement. The tiny little bucket contains pieces of chalk. Moving to the left, there is obviously a key rack. The top small basket contains gift cards. The one right below it contains my husband’s glasses and car keys and whatever else he has in his pockets. The large metal envelope is a spot for bills to be paid, and the cute little egg basket below it contains plastic grocery bags. The organizer with three bins holds receipts, coupons, and miscellaneous papers – like the owners manual from the new microwave I’m still learning to use. The small basket below holds items for the pets and the large metal envelope contains reusable shopping bags. Each family member claims one of the bins to the far right. Sorted mail, as well as various other things which need to be readily available near the door – for example umbrellas, are stored in these bins. The charging cord is semi-permanently attached to the inside of the charging station and routed behind the bench to the outlet thanks to Blue Key World Cable Clips. As I completed this project I learned that my son’s school would be issuing each of the students a Chromebook for the year. This meant that he would need a charging station near where he keeps his backpack and other items he needs for school. This helps so much with the morning rush out the door. 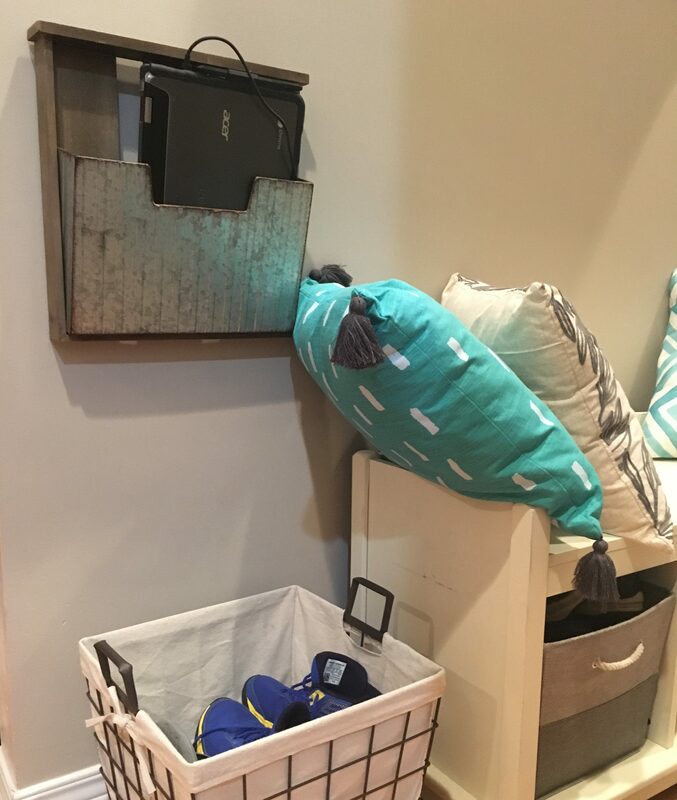 Since installing this little charging station right above his shoe bin, we have not had to run back in a single time to grab his Chromebook. The cords are kept hidden with the help of Blue Key World cable clips and a couple of well placed pillows. 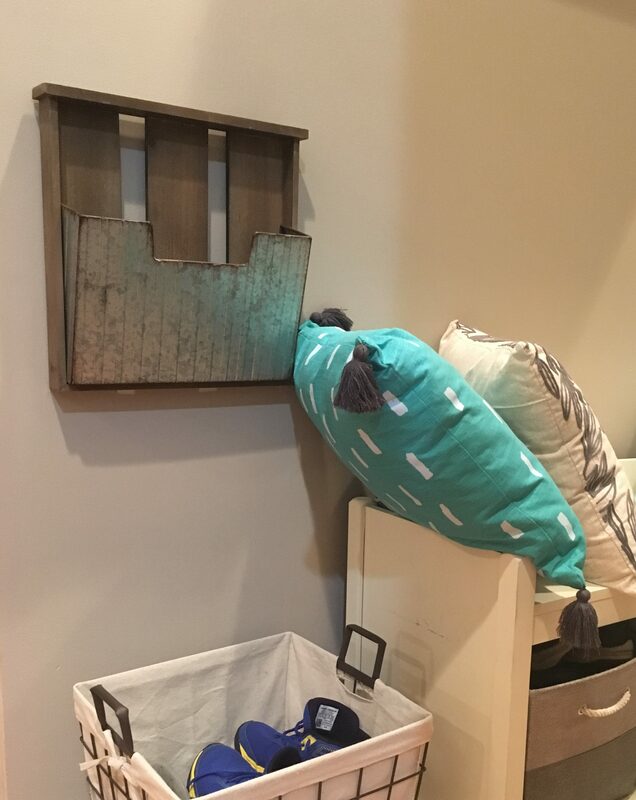 I found this cute little bin at HomeGoods and with the help of the great people at Blue Key World I was able to completely hide the charging cord even though the outlet is on the other end of the bench from the charging station. I used one Blue Key World cable clip near the outlet, one of the back side of the bench near the charging station, and one inside the charging station to keep the cord easy to reach. Blue Key World Cable Clip keeps the charging cord within easy reach near the top of the charging bin. Just for fun, here’s a before shot of the same hallway. To close I will offer these final thoughts. Our command center has really helped with keeping things more organized. It doesn’t always look like it does in the photos above. Mail bins are sometimes overflowing. Currently there are two jackets on top of the bench instead of hanging on the hooks because our camera equipment is hanging from the hooks. I still sometimes have to remind everyone to use the shopping list. I hope these suggestions have helped you come up with ideas for your own command center. Leave any questions you may have in the comments below and I will be happy to try and answer them. Disclaimer: We are a participant in several affiliate advertising programs including the Amazon Services LLC Associates Program, an affiliate advertising program designed to provide a means for us to earn fees by linking to Amazon.com and affiliated sites. This program results in no added costs for you but helps support our web page. Sondra, I love your blog. Your topic today is so needed in everyone’s home. Love it and will be looking forward to more of your ideas and tips. I just love your gallery wall. You styled it perfectly! Thanks so much Terrie, I’m really happy you liked it!